A record-setting heat wave is the latest weather catastrophe to beset Japan. On Sunday, a weather station outside Tokyo reached the hottest temperature ever recorded in the island nation, and emergency responders have been swamped with requests for help in the searing heat. This summer has been one of catastrophe for Japan. The heat arrived in mid-July, following record rains that killed at least 200 people and a typhoon that strafed the country’s southern islands. Things really began cooking this weekend, though, and reached a fever pitch on Monday. 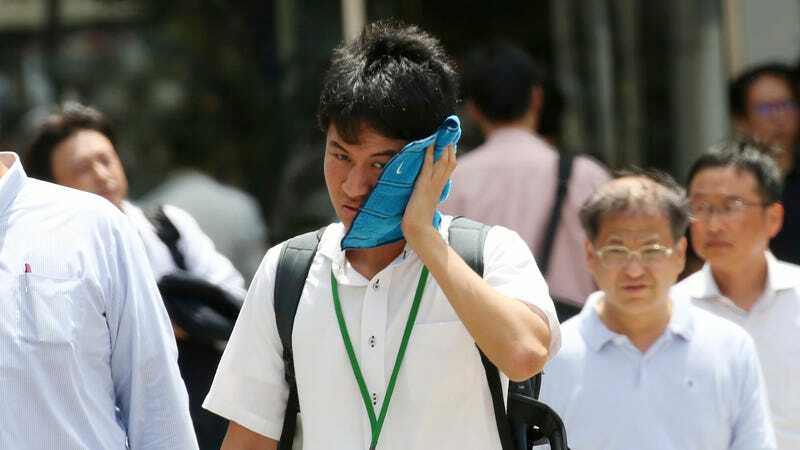 Kumagaya, a town located about 40 miles northwest of Tokyo, suffered through temperatures of 41.1 degrees Celsius (106 degrees Fahrenheit) on Monday. That set a new all-time heat record for Japan, besting a 2013 reading of 41 degrees Celsius (105.8 degrees Fahrenheit). Tokyo also set an all-time record for the city, reaching 40.8 degrees Celsius (105.4 degrees Fahrenheit). But the heat has hardly been confined to the metro area. According to Kyodo News, nearly 70 percent of weather stations monitored by the Japan Meteorological Agency have recorded temperatures in excess of 30 degrees Celsius (86 degrees Fahrenheit). At least 241 of the 927 stations in the network have cracked 35 degrees Celsius (95 degrees Fahrenheit). Only Hokkaido to the north has managed to keep its cool. Nighttime has provided little relief. Overnight lows have hung around the upper 20s Celsius (low to mid-80s Fahrenheit). The relentless nature of the heat has led to a number of deaths and hospitalizations. At least 77 have died from heat-related illness since July 9, including 11 people who died on Saturday alone, according to Kyodo News. The news agency also reports that more than 30,000 people have been sent to hospitals over that period. On Sunday alone, the Tokyo Fire Department dispatched a record-setting 3,125 ambulances, largely due to people suffering from heat stroke and exhaustion, according to AFP and Kyodo News. All this has prompted dire warnings from the country’s weather service. The atmospheric source of Japan’s misery is a wavy jet stream. The fast-moving river of wind in the upper atmosphere keeps weather moving around the planet, but kinks have formed in it recently, causing weather to essentially get stuck in place, like eddies in a watery river. The kink that’s formed over Japan has allowed high pressure to build over the past couple weeks, and with it, the dangerous heat. While the heat wave certainly has natural roots, it’s impossible to talk about what’s happening in Japan without including climate change. 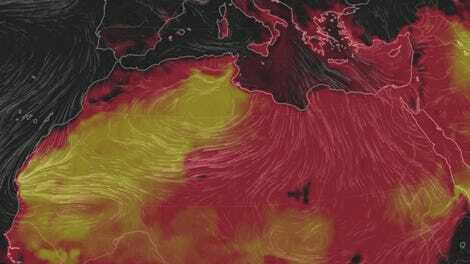 The heat that’s built up on our planet has made heat waves more common and more intense. “It’s easier to set extreme heat records when the baseline is pretty darn warm,” Jeff Masters, a meteorologist with Wunderground, told Earther. He also pointed to the wavy jet stream as another potential link to climate change, noting that previous research has shown patterns like this could become more common. The all-time heat record in Japan is an outlier for the country, but it’s hardly alone this year. We’ve seen freakish heat waves in Greenland, Pakistan, the UK, Scandinavia, and North Africa. Something just isn’t right. No specific analysis has been done to determine how climate change has affected this heat wave. But what we’re witnessing in Japan right now—the deaths, calls for ambulances, Japan’s famously on-time trains reportedly running slow because people are suffering from heatstroke—is exactly what climate change looks like. And if we don’t start to curb carbon emissions soon, it’s going to look a lot worse, and the poorest among us will suffer the most.